The hard part was choosing which product to pick out of the grocery store freezer! Hey this Texas heat is nothing to take lightly and a temporary relief is always needed! The product I choose was the Chocolate Truffle. Let me just say...YUM!!! Their decadent taste will fool you because since they use low fat ice cream they are able to bring this yummy goodness to us in just 100 calories! How is this even possible? 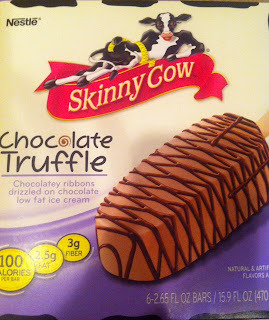 I have no idea, but thanks to Nestle and Skinny Cow they have found a way!